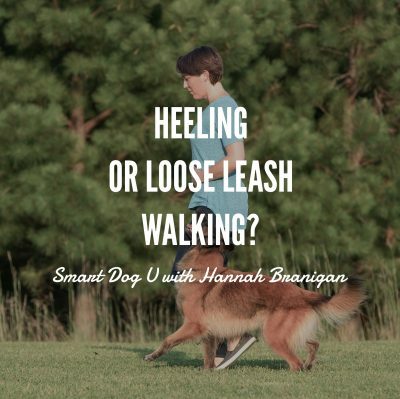 Is There A Difference Between Heeling and Loose Leash Walking? Guest Post by Hannah Branigan of WonderPups Training. It’s our lucky day, folks. One of my very good friends, Hannah, has written a piece for Smart Dog U’s blog. Hannah’s a self-professed dog nerd, a brilliant trainer, and a wickedly funny person. If you haven’t caught her podcast, Drinking from the Toilet, make sure you head there after you read this. You can thank me later. Without further adieu, heeeeeere’s Hannah! Surely, there can’t be much. Depending on your goals and needs with your dog, heeling and loose leash walking can be two totally different behaviors with different functions. Both are potentially useful in everyday situations and also in competition. And here’s the cool part… with training, ANY dog can learn to do both versions. It’s just behavior! These two behaviors have a lot of things in common. With both heeling and loose leash walking, the dog should stay (more or less) beside the handler, matching the handler’s direction and speed. You stop when I stop, you go when I go. In both cases, that requires a certain amount of the dog’s attention to stay with the handler, so that he can adjust his behavior based on the handler’s movement. So in both cases, the handler’s body movements act as cues to the dog. The way you move your body, shifting your weight, turning your head and such, predict which direction you are about to go. And that acts as information, aka a “cue,” to tell the dog what he needs to do to stay close to you. You’ve already experienced this at home anytime you start walking toward the kitchen. Your dog can read the very smallest of movements that indicate you are about to head toward the refrigerator, and that is VERY important information for dogs to have. The primary difference between heeling and loose leash walking lies in the level of precision, and thus how closely and quickly the dog must respond to those movement cues and adjust his behavior. The relative intensity of these two different behaviors is reflected in the mechanics of how the behaviors are performed (how the dog uses his body to meet criteria). The “heeling” dog is tightly coiled, ready to respond instantly, and so he carries his body differently and changes the way he moves in order to be able to quickly change direction. As sort of a side note, this means there are also significant differences in the duration of performance… how long the dog is expected/able to maintain the behavior. Typically, loose leash walking is performed for a MUCH longer period of time… 30 minutes or an hour, easily, where heeling is usually performed in shorter, intense bursts of 30 seconds to a minute, maybe 2 minutes, at a time. When we take the dog for a walk (you know, just a normal dog walk) around the neighborhood, we mainly want to relax and get a little exercise and enrichment for ourselves and our pups. So functionally, we need a behavior that keeps the dog within a 6ft radius of us as we go along, and keeps the dog from tripping us as we walk. Generally, staying to one side, and responding to turns or stops within a couple steps, is plenty to meet our needs. So the dog needs to have enough awareness of the handler to register a change of direction within a second or so, but the rest of the brain can be in chill-out mode. Since the human is usually in chill-out mode at the same time, this usually works pretty well. We aren’t making any sudden changes that would require the dog to stay particularly vigilant. Heeling is a lot more “expensive” for the dog because he has to really focus tightly on the handler to maintain a precise position and change direction and speed almost simultaneously. With heeling, we want the dog to stay within a SINGLE INCH of the same position relative to the handler. So if the dog’s collar is level with the handler’s kneecap, that collar should never drift more than an inch ahead or behind, or closer or further away. It should be as if there is an invisible, 1-inch long bungee cord, tethering the dog to the handler at all times. In order to maintain this high level of precision, the dog has to REALLY be paying close attention to what the handler is doing, and be physically prepared to change speed or direction at any moment. Visualize an athlete on the balls of her feet, ready to explode when the starter pistol fires. Perfectly balanced, every neuron focused on what’s coming next. It’s intense! You can’t maintain that kind of intensity for long. When on a relaxed trail ride, the horse still pays attention to cues from the rider, but his head is down, and he focuses on putting one foot in front of the other. There’s no urgency (I mean, assuming there isn’t a bear or something) and most of the horse’s attention is on the world around him (and under his feet). He may still walk, trot or gallop, but the transitions are more gentle (unless there’s a bear). When performing in the dressage ring, the horse shifts his weight much further back, so that more of his weight is balanced on his hind legs (this is called “collection”). This allows even a big horse to perform delicate maneuvers on a dime because his body is prepped to move in any direction. He carries his head much higher by comparison, and his responses to his rider are almost instantaneous. Now, this isn’t entirely fair labeling, because (just like with our behaviors above) both types of horses have to perform both types of tasks as they go through life. But generally, a dressage horse performing at high levels has a much higher degree of precision (requiring focus and physical skill) for short bursts, compared to the trail horse who is expected to walk much more casually, and for longer periods of time. Of course, a good trail horse also needs to be able to move with focus and precision from time to time, as anyone who has tried to open and close a gate without dismounting can tell you… inches matter! And the dressage horse isn’t in performance mode all the time, just for short bursts. Tightly focused, attention heeling is of course part of performing in obedience or rally. But it’s also really handy when navigating tight spaces or distracting environments. Trying to squeeze between parked cars to pass another dog on a walk? Calling your dog to a close, focused heel is really helpful for the few seconds it takes to get by. Of course, this is the behavior we want most of the time with our dogs. When going out around the neighborhood, we don’t need (or want) to try to maintain focused heeling. Here, more casual “walk with me and be cool” is a perfect fit.